So I'm busy at work with a lot of knitting these days, back to my projects after a busy pre-christmas knitting frenzy. I'm glad the slippers received such a warm welcome in the west, so warm that I may need to knit another pair or three out east. 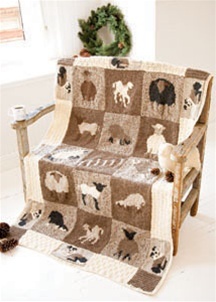 MARY KNIT A LITTLE LAMB Curl up and count away under a sepia-toned afghan of grazing sheep and lazing sheepdogs.